Belconnen Arts Centre strives to offer an open and accessible environment for all to enjoy. The Centre is fully wheelchair accessible, with the entire building on a single level. Where a person with a carer attends an event or class, that person’s carer is eligible to attend free of charge. Please contact the Centre in advance of attendance to advise if you would like to add a carer to a ticket or enrolment. 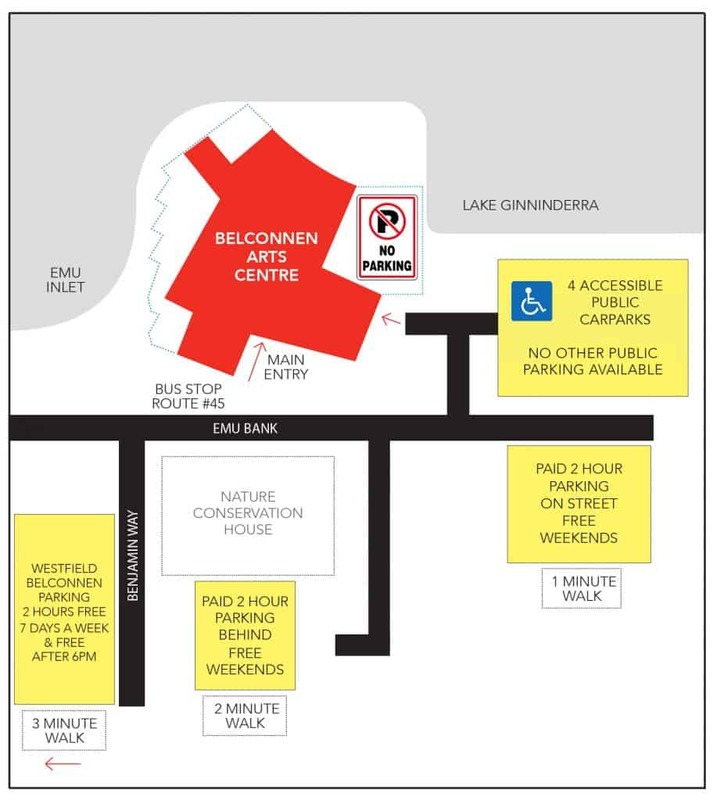 Belconnen Arts Centre has limited disability parking available on-site. Please see below map for nearby parking and drop-off/pick-up locations. A wheelchair is available for use by members of the public on request. Wheelchair bathroom facilities are available. The Centre is fully wheelchair accessible, with the entire building on a single level. The Foyer and Dance Studio spaces feature audio hearing loops. Please request these to be activated at the reception desk. If you are deaf or have a hearing or speech impairment, contact us through the National Relay Service. Give them Belconnen Arts Centre’s main contact number, (02) 6173 3300, or the number of the staff member you want to call. For more information, visit www.relayservice.gov.au. Belconnen Arts Centre is committed to offering a strong program of accessible arts events, and the Centre is home to Creative Program Officers supporting our community arts and cultural development programs. The Officers work together with the community to present events such as IGNITE: Alternative Arts Academy. BAC also hosts a fortnightly inclusive community dance program, IGNITE: Room to Move, and weekly Dance for Wellbeing classes that cater to people with Parkinson’s, Dementia and other conditions. In 2012, 2013 and 2015, Belconnen Arts Centre received the Chief Minister’s Inclusion Award, in the Community and Business category. The Inclusion Awards acknowledge achievements of organisations that have clearly demonstrated their commitment to encourage, welcome and support people with a disability in the community. For more information, please call us on (02) 6173 3300 or email info@belconnenartscentre.com.au.